President Trump did not let former Vice President Joe Biden's repeated physical threats (no matter how jocose) go unanswered, tweeting Thursday that if he was to meet him in a fight, he'd be the clear victor. 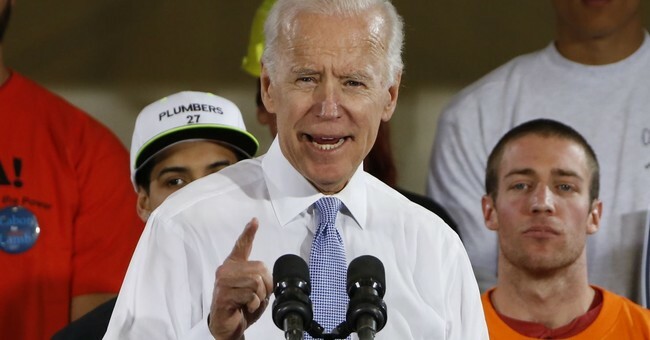 On Wednesday, Biden told an audience at the University of Miami that if given the chance in high school he'd "beat the hell" out of Trump over the now infamous "Access Hollywood" tape. Biden made the remarks during a rally for his "It's on Us" campaign, intended to inform students how to combat sexualt assault on campus. "They asked me if I’d like to debate this gentleman, and I said 'no,'" Biden told the students. "I said, 'If we were in high school, I’d take him behind the gym and beat the hell out of him.'" Yes, our leading officials are bragging about who has the biggest muscles. Sen. Ben Sasse (R-NE), for one, was fed up.